A glimpse into what 'designer' can mean sometimes. Check out the 'before and after' below. This is a little project for a big account. The account was looking for custom plush toys for their store for their holiday 'story'. To help this account 'imagine' what these custom plush toys would look like (and to save us the cost of sampling these from the factory) I've photoshopped them to their new colour palette. 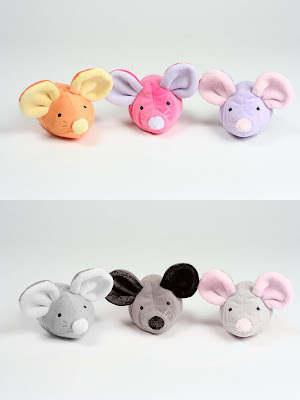 Here's a before and after sample (click to see full size) - the mice 'before' in the brights were better for easter and spring seasonal displays, while the traditionally-coloured grey, black and pink versions below better suit the holiday look. Below is another toy from the series. Simply by changing the colour palette and textures, I've changed this dog from a summertime picnic pet to a wintertime snuggle puppy!